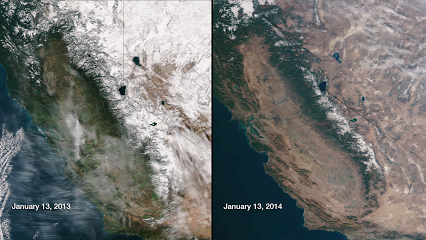 The picture shows snow in the mountains of California, 2013 and 2014. Snow usually provides 30% of California's water, so that was bad news. But 2015 was much worse. "We're not only setting a new low; we're completely obliterating the previous record," said the chief of the California Department of Water Resources. There's now only 5% as much snow as the average over the last century! Is all this due to climate change? This is the kind of thing we can expect. "People should realize we're in a new era. The idea of your nice little green grass getting lots of water every day - that's going to be a thing of the past." Brown's seven-page executive order, issued Wednesday, outlined the first statewide mandatory water use restrictions in California's history. Among them: He ordered a 25% reduction in urban use statewide compared to 2013 levels. The directive also bans the use of drinking water to irrigate median strips in public roads, initiates the removal of 1,150 football fields worth of grass to be replaced with drought-tolerant plants; and orders golf courses, campuses and cemeteries to significantly cut their water consumption. Agricultural mandates were milder. Irrigation districts were directed to develop drought management plans that include supply and demand data. Agencies in basins where groundwater has been overpumped must immediately monitor groundwater levels. And the State Water Resources Control Board was told to crack down on illegal water diversions and "those engaging in the wasteful and unreasonable use of water." The vast majority of Brown's plan focused on urban water use — such as lawns, golf courses, parks and public medians — which makes up less than 25% of Californians' overall water use. For critics of Brown's plan, it's ineffective policy to crack down on watering suburban yards while largely ignoring the vast, still-green expanses of the state's fruit and vegetable garden. "The government's response to this growing crisis has been behind the curve," said Jonas Minton, water policy advisor for the Planning and Conservation League and a former state water official. He argued that state officials should clamp down on groundwater pumping and plantings of thirsty new crops. Jeffrey Mount, a senior fellow at the Public Policy Institute of California, said growers have been dealing with water cutbacks for years. As for regulating which crops growers plant, Mount said that could distort the market and have unintended economic consequences. "It's our view that government probably is not going to do a very good job of deciding what should and should not be grown." Moreover, Mount said that while the state could ban certain plantings under its constitutional powers to stop the unreasonable use of water in a drought, growing high value crops such as almonds would not be considered unreasonable. "I think much of California is all of a sudden waking up to the fact that the drought is not theoretical. It's going to manifest itself in ordinary Californians' lives for the first time. "You do that overnight and there is extraordinary disruption," Mount said. "In some basins, this is going to be very painful, economically and socially, and you have to be careful about forcing that pain too quickly." "Well, our farmers have been feeling it for a while," said Chris Scheuring, a water attorney for the California Farm Bureau Federation. Scheuring, noting that at least 40% of residential water use in the state is for landscaping, said that urban cuts don't have the same economic impact as slashing irrigation deliveries. "Folks are still going to brush their teeth," he said. "They're still going to run their dishwashers …flush their toilets. It's just that their lawn might be brown and they're going to have make some hard choices about landscaping. "That's a different thing from telling a farmer goodbye to 25% of what little [water] you may have. That has direct economic consequences." Other water experts and growers say that agriculture has already suffered severe cutbacks as a result of the drawn-out drought, now in its fourth year. For the second year in a row, Central Valley farmers without senior water rights are expecting no deliveries from the valley's big federal irrigation project. Growers who get supplies from the State Water Project will receive only 20% of requested deliveries this year. Farmers left more than 400,000 acres unplanted last year, dealing a $2-billion blow to the state's agricultural economy. The Legislature approved a statewide groundwater law last year intended to end decades of overpumping from aquifers in the Central Valley. But it won't take full effect for more than two decades, a timetable that critics say is far too generous. The rules are expected to limit withdrawals in some basins, forcing farmers who have increasingly relied on pumping groundwater to permanently retire cropland. Experts say change that significant requires time. We definitely need to improve agriculture. But don't forget: for the second year in a row, farmers in California's big Central Valley are getting hit with big water cutbacks. The ones who get water from the State Water Project will receive only 20% of their usual amount. While farmers are moving to more efficient irrigation practices, they still practice wasteful flood irrigation on about 40% of irrigated acreage, said Heather Cooley of the Pacific Institute, an Oakland think tank. "We have a long way to go," she added. Phil Isenberg, vice chairman of the Delta Stewardship Council, said the sections of Brown's order demanding more water use data from agriculture are "a very dramatic change." Not only does the state lack information on all water diversions by farmers, groundwater pumping in the Central Valley has gone largely unmonitored for more than a century. "You gotta know who's using what," he said. "Should it do more?" he said of the order. "Yes, but the seriousness of seven pages of executive order with specifics is quite unusual."